There must be a reason St. Valentine’s Day falls in February*, a cold, snowy month in much of the northern Hemisphere. It must be because there is something inherently romantic about cold weather. Cold, snowy days inspire romance. When it’s cold outside, we like to curl up by a fire. We like to sip warming drinks like cocoa or brandy. When it’s cold outside, we like to snuggle against someone warm. Cold outside = romance inside. In short, February is ideal for romantic getaways at our Berkshires Bed and Breakfast. All that cuddling and snuggling by the fire is even better after a day out in the cold. Plenty of opportunities to enjoy the winter weather exist near our Berkshires inn: downhill skiing and snowboarding, cross country skiing, snowshoeing; this winter, which has seen relatively little in the way of snowfall, hiking is an option. Nearby Jiminy Peak has great skiing, and après ski entertainment to help transition to romance. Their John Harvard’s Restaurant and bar has live music every Saturday and Sunday from 3:30 to 5:30 p.m. To accompany the music, food and drink specials run from 3 to 5 p.m. Nothing puts some people in a romantic mood more than a few hours of cross country skiing. For these folks, a trip to Canterbury Farm Ski Touring Center in Becket, or Hilltop Orchards in Lenox is an order. For those who find romance in adventure, try the moonlit snowshoe trek at Hilltop Orchards. Weather permitting, the next two take place Saturday, February 4 and Saturday, March 10, 2012. 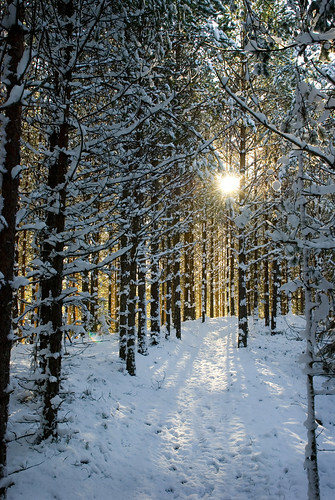 Walk hand in hand through the snowy, New England woods. Find warmth and entertainment by a bonfire or inside by the fire, and enjoy wine tasting as well. Back at our luxury Bed and Breakfast Berkshires, have a soak in a whirlpool tub or a relaxing steam in a steam shower. Sit together in front of your own fireplace and let romance blossom. Our Romance Package includes a sumptuous 3-course dinner for two, as well as chocolate and a split of champagne. Please see our Berkshires Inn Specials page for more details. * In truth, St. Valentine’s Day dates back to the days of ancient Rome, a city not known for it’s extreme cold or snow. For the purposes of the this blog, we chose to overlook that fact.